The Traction Control System (TCS) enhances traction and safety by controlling engine torque and braking*. When the TCS detects driving wheel slippage, it lowers engine torque and operates the brakes* to prevent loss of traction. This means that on a slick surface, the engine adjusts automatically to provide optimum power to the drive wheels without causing them to spin and lose traction. The traction control system (TCS) cannot compensate for unsafe and reckless driving, excessive speed, tailgating (following another vehicle too closely), and hydroplaning (reduced tire friction and road contact because of water on the road surface). You can still have an accident. Driving without proper traction devices on snow and/or ice-covered roads is dangerous. The traction control system (TCS) alone cannot provide adequate traction and you could still have an accident. This indicator light stays on for a few seconds when the ignition is switched ON. If the TCS or DSC* is operating, the indicator light flashes. If the light stays on, the TCS, DSC* or the brake assist system* may have a malfunction and they may not operate correctly. 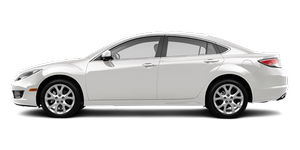 Take your vehicle to an Authorized Mazda Dealer. - In addition to the indicator light flashing, a slight lugging sound will come from the engine. This indicates that the TCS is operating properly. - On slippery surfaces, such as fresh snow, it will be impossible to achieve high rpm when the TCS is on. Refer to TCS OFF Switch. If the light remains illuminated and the TCS is not switched off, take your vehicle to an Authorized Mazda Dealer. The TCS may have a malfunction. If the battery is disconnected or a fuse is replaced, the TCS will be inoperable. When this happens, the TCS OFF indicator light flashes and the TCS indicator light illuminates. To reactivate the TCS, perform the following procedure with the battery connected. 1. Switch the ignition ON. 3. Make sure the TCS OFF indicator light and TCS indicator light turn off. If the TCS indicator light and the TCS OFF indicator light remain illuminated even after switching the ignition ON, attempt the procedure again. If this still does not work, consult an Authorized Mazda Dealer. Press the TCS OFF switch to turn off the TCS. The TCS OFF indicator light will illuminate. Press the switch again to turn the TCS back on. The TCS OFF indicator light will turn off. - When TCS is on and you attempt to free the vehicle when it is stuck, or drive it out of freshly fallen snow, the TCS will activate. Depressing the accelerator will not increase engine power and freeing the vehicle may be difficult. When this happens, turn off the TCS. Press the DSC OFF switch to turn off the TCS. - If the TCS is off when the engine is turned off, it automatically activates when the ignition switch is turned on. - Leaving the TCS on will provide the best traction.